I recently took a vacation in Sweden and was completely charmed by the natural beauty as well as the graciousness of the people. I've never met people who talked more about the weather, or cherished the summer sun more, I guess because the country is dark and cold for so much of the year. While I was there, they were having an unusually spectacular Swedish summer, I was told. It's true enough that the days were mild and warm, and the evenings cool and crisp. One of the things I noticed was that the Swedes are always ready for a swim. Even in Stockholm, I spied bathing suits and towels tucked into work bags in case the opportunity for a dip presented itself. The water felt COLD to me, but they just called it refreshing and jumped right in! So here are some Swedish swimmers on the Stockholm archipelago island of Grinda caught taking a dip during a midday break. Remember back in February when I shared those sunset watercolors? I've kept at them, and I thought I would share a few I did this spring. They've gotten a bit bigger. The ones I posted last time are only about 4"x6" or so, but these have grown to 9"x12" or even 12"x16" or larger. I just felt like I wanted more space! And though it might be unusual for an artist working in New York City, I usually ignore the buildings, although occasionally, I'll put in some of their lights. Mostly I just concentrate on the sky, or a small group of clouds. I really enjoy the daily doing of it. Watercolor feels just right for the ephemeral nature of the clouds, and the their ever-changing colors. And in the end, I have a record not just of that day's sunset, but also how I enjoyed it. Since I've had the watercolors out so much, I've been using them to do my sunsets. I thought I wouldn't really have time to finish each one before the light changed, but it's actually been perfect. By the time the light's changed, it's usually time to start the next one anyway. These are from last month, and I have a whole lot more to share. Those of you who know me IRL will know that I like to go in order! The Lunar New Year has just passed, and so I sat down with some watercolor and a roll of very thin paper to do a little horse watercolor. The paper's not really meant to take all this water, and you can see that in all the wrinkles and marks of the water evaporating. I don't know if I just like breaking all the rules, or the impressionistic effect. Once I amp it up in Photoshop, of course, it takes a more intense feeling. I couldn't decide which I liked better, so I'm posting them both. Here's wishing you and yours health, wealth, and prosperity! A few posts ago, I shared a drawing from an exercise where we had to separate line from marks from color. Towards the end of that afternoon, we got to loosen up the strict guidelines. 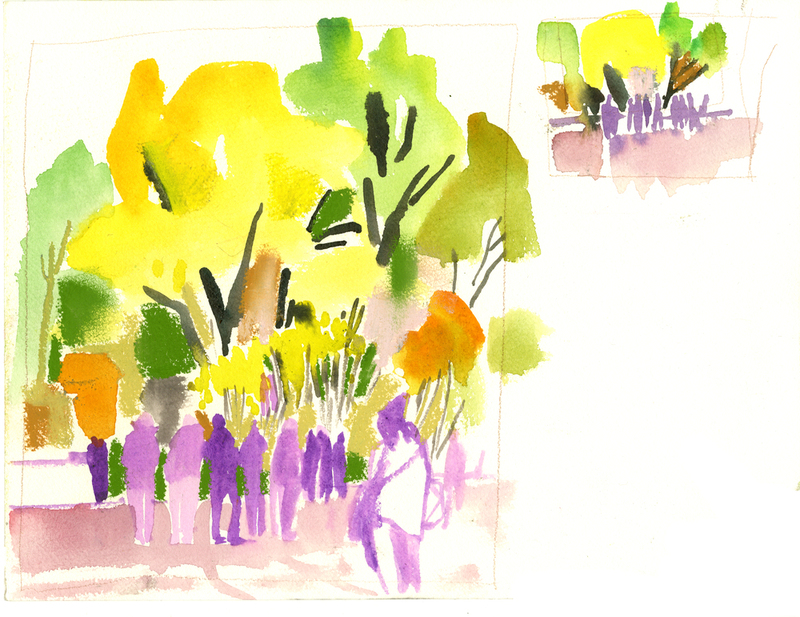 So here is a quick study of the Crystal Palace, where I happily reunited color, marks, and line. Felt good to let them all get together again! While I was at Disney this summer doing a Dalvero class, I did an exercise that forced me to separate lines, marks, and color and only work with one at a time. Sounds annoying, right? I thought so too, until I started drawing and I remembered that, paradoxically, imposing some limits really helps me work. Otherwise, there's just so many directions to go, it can be overwhelming, baffling. So, I'm sharing a drawing I did during that exercise, all blocks of color. I may have added a line or two later (although a persnickity classmate pointed out that a line *is* a shape! ), but mostly just blocks of color! This was a brother and sister. The little brother was getting restless over a leisurely lunch and it looked like it was big sister's job to look out for him, keep him quiet and entertained while the rest of the family finished their meal. The Charles W. Morgan is in the water, and the show, which I've been so privileged to be a part of, is over. The Dalvero Academy went to Mystic Seaport to watch the ceremony, and now she floats, like a *real* whaler! But I kind of miss seeing her towering over the shipyard, floating in the air, with all the workers gathered around, attending to her. You could get up close to her, and get acquainted with the hull, hidden now beneath the water. I'm sure in the year to come, there will be plenty of drawings of her in the water to post, but for now, I'm sending this incarnation of her off with drawings of the shipyard workers fixing up the hull, with scaffolding all around. Maybe they miss her like this too. Several of my fellow Dalverans have posted their beautiful reportage drawings of the launch ceremony. Definitely check out Ronnie's, Evan's, Julia's, Jen's, Eddie's, and Dominick's amazing drawings! After stepping into the bottom half of their costumes (think colorful, layered hula skirts), one of each pair of dancers puts on the head of the horse, also covered in raffia. The music begins with a dreamlike harp, and a playful, bell-like percussion instrument. The live musicians add so much excitement to the piece, I can't imagine the piece with recorded music. The horses, newly awakened, sniff and nose each other, and playfully prance and high-step around. They notice the audience and come over to greet curious onlookers nose-to-nose. Suddenly, a drum sounds. The dancers break apart and sway, shake, and shimmy. The raffia of their costumes make them look like friendly, magic muppets. And just as suddenly, the drum fades and the harp re-emerges, and the horses reassemble themselves. I had a professor in college who said that the ancients thought inbetween spaces and states were tricky. Places like crossroads—and train terminals, if they'd had them—could be unpredictable, and wise travelers sought the protection of Hermes to see them through the dangerous crossing. You would leave a trusted space like your home to go to some other known place, but until you arrived there, you were in a space unknown, a space where anything could happen. Nick Cave's piece really reminded me of that idea. At the crossroads, leaving the familiar and the known, we step into a magical place—perhaps unpredictable, but also beautiful and joyous. If you haven't already seen it, it's performed twice a day through Sunday, so definitely go see it! I went to Grand Central Terminal this morning to see Nick Cave's art/performance piece Heard NY. The first time I heard of him was back in 2011 when Mary Boone showed his Soundsuits in Chelsea. I clearly remember feeling that it was one of the highlights of the year for me. Every day this week, twice a day, his magical "heard" of horses are brought to life by Ailey students (of Alvin Ailey American Dance Theater) to parade, frolic, dance, and enchant the crowd of Grand Central Station commuters (and some New Yorkers in the know). There is a live harpist and drummer, and the effect of everything together is rousing. I didn't get there early enough to beat the crowd–but drawing the crowd is part of the point! I only have a couple of drawings to share today, but I'll be posting at least a couple more once I have a chance to go back and finish them! The horse suits waiting for the performers to imbue them with life. Even uninhabited, they project a lifelike presence, without being in the least tied to reality. That's what I love about art: how something can be completely untethered to reality, but feel so true. It's better than real! The dancers becoming the "heard." Even though you see the transformation happen before your eyes—and you can see that it's as banal as tying on a skirt—it still seems magical once the suit is on. Part 2 will be coming later in the week, as soon as I've been able to see the performance again. If you're in town, don't miss it! If you can't catch it, I'm posting a youtube video that will perhaps console you.